In summer of 2015, Stormy Ray received the Sylvia Wenke Appreciation Award! 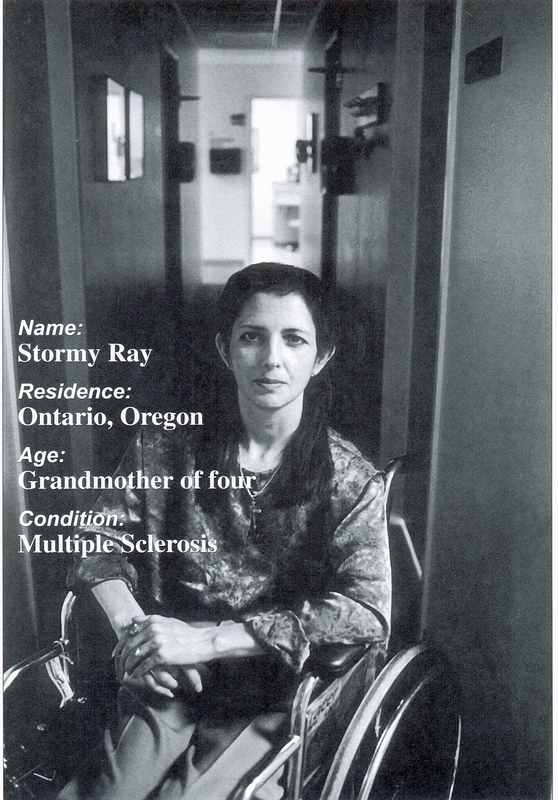 Stormy was an EOCIL Board of Directors 2000-2001. Presented by the Eastern Oregon Center for Independent Living in Ontario, Oregon. Mrs. Sylvia Wenke was an energetic and compassionate advocate for people with disabilities. Sylvia was one of the founding Board of Directors for EOCIL and it was her dedication and energy that helped us succeed with our mission of assisting people with disabilities to live independent lives. Sylvia was our moral compass from 1997 until her death in 2014. She will be missed! History: Stormy Ray has been active in the movement to legalize marijuana for the purposes of medical treatment for nearly two decades in Oregon. She was a Co-Chief Petitioner of Measure 67, which became the Oregon Medical Marijuana Act of 1998 (OMMA). The Stormy Ray Cardholders’ Foundation is a non-profit Oregon medical marijuana information and support organization dedicated to helping patients utilize this law. Stormy has served on the Oregon Medical Marijuana Program’s Advisory Committee, ACMM, the Oregon State Vocational Rehabilitation Advisory Council for two Governors (6 ½ years) and the Federal Disabilities Determination Advisory Board for 4 years. As president of Malheur Butte Productions, a non-profit disabilities awareness organization, Stormy worked to improve access, inclusion, and awareness for Oregonians with disabilities. The Foundation name has been changed to the Stormy Ray Cardholders” Foundation (SRCF).